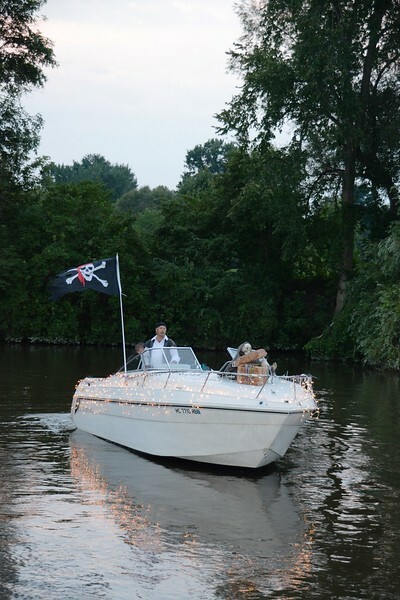 Everyone looks forward to this Parade each year on the Pine River in St. Clair. Spirits were high and as the night started to fall, the lights on the boats came on for a spectacular parade in Honor of William E. Cedar. The boats met at the back Marina and then headed down Pine River to the St. Clair River, turned left and went in front of The Voyageur Restaurant and town. Everyone cheered them on. Afterwards, a bomb fire was lit and hot dogs with trimmings, including cookies from Achatz Riverview Restaurant where shared. It sure was fun!